Slow Cooker French Dip Sandwiches - slow cook chuck roast in a mixture of soy sauce, beef broth, onion, garlic, rosemary, thyme and pepper. Serve on toast buns with melted pepper jack cheese. These sandwiches are SO good! 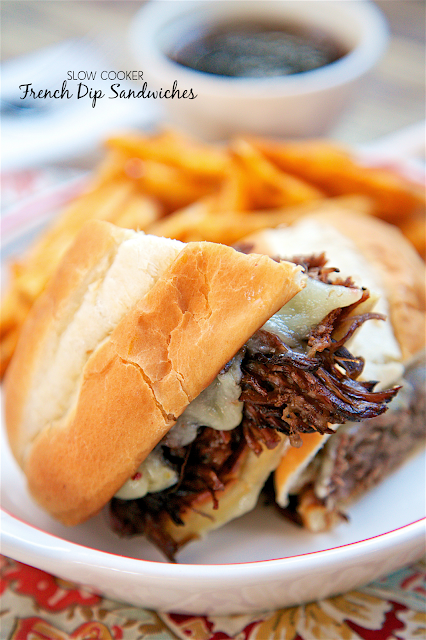 I think they are the PERFECT French Dip Sandwich! I have a serious weakness for a really good French Dip sandwich. I always order a French Dip if it is on the menu when we go out to eat. I prefer just beef and cheese on top of a toasty garlic bun. 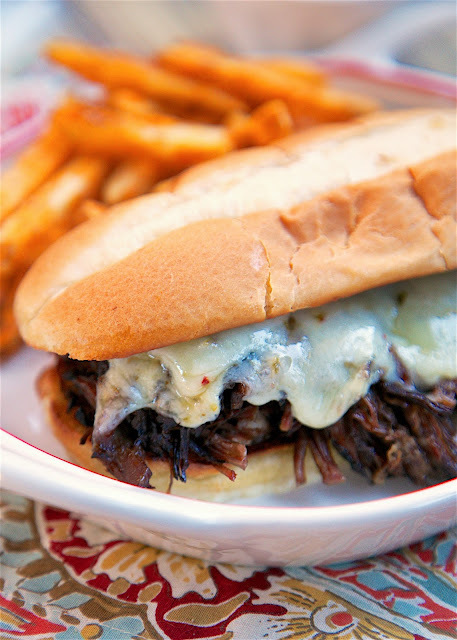 The key to a good French Dip is the Au Jus dipping sauce on the side. It has to have lots of good flavor to sop up with your sandwich! This recipe for Slow Cooker French Dip Sandwiches fits all of my criteria for a great French Dip! 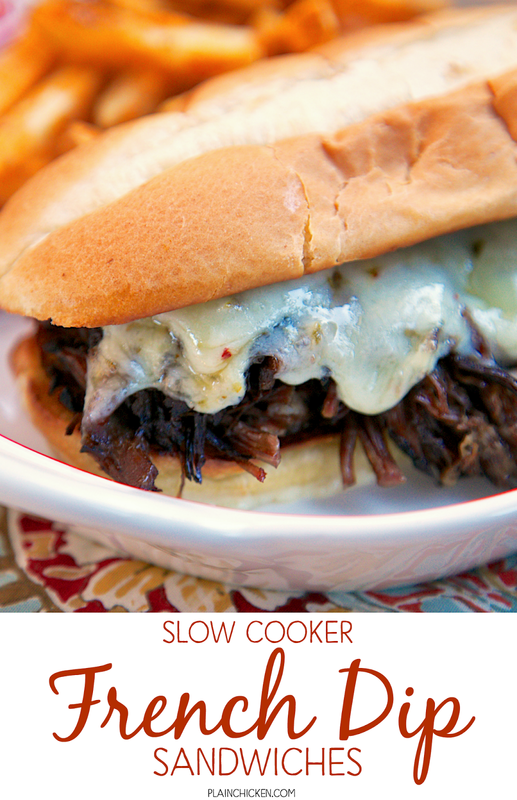 PLUS it is made in the slow cooker, so it is easy peasy to make! Just dump everything in the slow cooker and let it do all the work. When you are ready to eat, toast the buns and melt some cheese on top of the beef. Don't forget to serve some of the slow cooker juices on the side! It makes the sandwich! We served these sandwiches on hoagie rolls, but feel free to use smaller buns and make sliders. Place roast in 6-qt slow cooker. Add soy sauce, beef broth, bouillon, bay leaf, garlic, onion powder, rosemary, thyme and pepper. Cover and cook on LOW for 8 hours or until very tender. Remove roast from slow cooker, reserve broth mixture. Shred roast with two forks. Preheat oven broiler to HIGH. Spread butter on cut sides of hoagie roll. Place under the broiler to toast. Divide shredded beef among rolls. Top with shredded cheese and place under the broiler until melted. Serve with reserved broth mixture for dipping. Do you think that this would work for a freezer meal? Just add everything to a zip loc, freeze and then thaw overnight before adding to crock pot? Looks delicious! This was a perfect Father's Day meal for my husband. Incredible flavor! My only hiccup was that I didn't know how long to broil my buns for, so, they got a little too toasty.. But, definitely a keeper recipe! Have you tried this with a leaner cut of meat—London broil, perhaps? I've only made this with a chuck roast. As always, please use your best judgment regarding substitutions and modifications. How could I use this same recipe in the Instant Pot? Would love this recipe in an Instant Pot version if you have i! Thanks!